All operator training provided by Safety First will be conducted at your facility for your convenience and to comply with OSHA standard CFR 1910.178(l). Your instructor will be Gary Gilman, a Certified Master Instructor with 18 years of experience in all class or lift trucks. 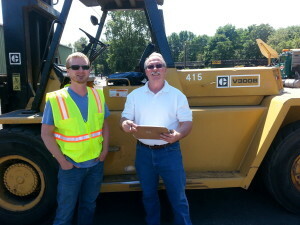 Gary has trained thousands of operators from all kinds of backgrounds. OSHA CFR 1910.178(i) States; Training shall consist of a combination of formal instruction, practical training, and evaluation of the operators performance in the workplace. The formal or theory training in the classroom will require approximately 2.5 to 3 hours depending on group size and lift truck classification. The practical training is a one on one activity that will be conducted on a rotational basis. For experienced operators the time required is approximately 10-20 minutes per operator. The time required for inexperience operators varies depending upon individual abilities. The concepts to be covered and performed by the operator: .